CAD Design… Improve Your Bottom Line! Improving the bottom line on any small part machining project is always front and center. CAD design has opened the door to cost savings in milling turning processes. Using a CNC machining center and the latest CAD design software can vastly improve productivity. CAD design enables the machinist to see a 3D rendering of a small part machining project. From the CAD design to the programing of the machining center, the machinist can compress production time. Through the use of the CAD design software, improved handling of parts can greatly reduce production time. Efficient handling of blanks for small part machining, tool pathways, rotating and repositioning is essential to improving production time. CAD design allows these stages to be effectively automated resulting in significant time savings. CAD design software can rapidly implement changes to a small part machining task. A small change in specification or design can be executed with little or no interruption of production. Lost production time due to a change is effectively eliminated by CAD design software automatically uploading new parameters to the CNC machining center. Automation of changes is complete and virtually seamless, saving time and money. CAD design affords the operator the ability to make vast improvements to the methods used to mount a small part machining project. Mounting fixtures for milling turning present challenges to the production, accuracy and number of times a project must be removed and remounted. CAD Design allows specific mounting hardware to be designed to maximize production time. Are you are looking for a machine shop with the expertise to efficiently produce a small part machining project? If so, JW Machine can help. 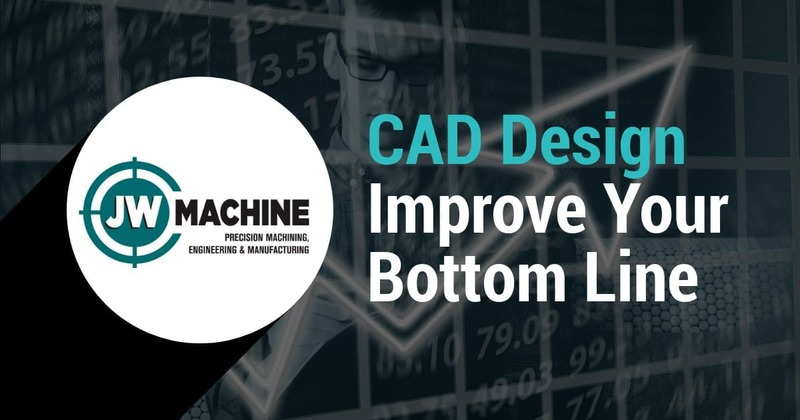 Our CAD design and machining center experts can put you on the path to improving your bottom line.